CTFC have advised us that tickets for our FA Cup First Round match with Bury will be available from the club on Saturday morning from 8.30; especially early to cover the half hour before the Alliance coach leaves for Hereford. 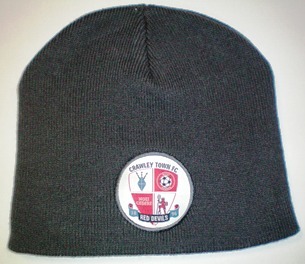 They will also be selling items from the club shop, particularly the fetching new Beanie Hat seen here- and as an Alliance member you’ll get 10% off the price of this and all other items! Final Reminder! Ian and Paul will be meeting with Alan Williams, CTFC Chief Executive, on Friday afternoon (4th November) for our regular Liaison meeting. This is an opportunity for supporters to put their questions and suggestions to the club. If you have any issues which you’d like us to raise, then please email chairman@ctfcsa.co.uk as early as you possibly can, as we need to compile a list! Thanks to those who have already been in touch, but if you have a thought or a question, don’t keep it to yourself! Finally, the club are looking for matchday help with programme sales and in the Ticket Office. This pays a salary, gets you free admission to the game, and gives you a meal voucher. If you are interested, please contact Gayle on 01293 410000 for more details.